In late August I spent to weeks traipsing through Europe—on very important work assignments in London, and taking in the local culture of Amsterdam. Being a gadget blogger, I couldn’t pass up the opportunity to completely load up my European adventure with every conceivable gadget I could possibly need. I wanted to travel like a 21st-century tech nerd—and it all went according to plan...for the most part. There were suitcases that charged phones, cameras that took 360-photos from the towers of cathedrals and even a $60 water bottle designed to monitor my water intake. I had a few grand of equipment on my back. While some of the tech made the trip memorable, others just dragged down what should have been an unforgettable affair. For two weeks, I lived out of a black hardshell Raden A-22 Carry ($295). Although that sounds like a slick jetplane, the Raden carry-on (there’s also larger check luggage version), is relatively cheap compared to most smart cases out there. The Bluesmart for example goes for $450. It’s best and most useful feature is also its simplest one: hiding a 7,800mAh battery in the zipped lining of the bag. Feeling the brunt of long Netflix sessions while taxiing on the runaway, I could just fish a cable out of my bag and charge up. Like the pricier Bluesmart, the Raden A-22 also includes a scale in the handle so you can weigh your bag and proximity sensors for locating your luggage. It all connects with an accompanying app (iOS only...for now) that has dead simple setup. But it’s not all sunshine. Although its hard, plastic exterior looks shiny and sophisticated, it is still plastic. It takes almost no effort to scuff the Raden, even if you actively try to avoid it. It makes what was once a nicely designed piece of luggage progressively uglier. Yet I wasn’t lugging it from tourist trap to tourist trap, because more important than your suitcase is your day-to-day backpack. I’m usually more of messenger bag person, but since I was traveling with a sizable tech horde in tow, I knew I needed a proper backpack. “Smart” backpacks come with a built-in charger or powerstrips. I decided on the Bobby backpack, because it has all those things and it’s designed to be theft-proof. While I can’t confirm it’s theft-proof, I am happy to report that no one robbed me while I wore it. The Bobby deters thieves by loading from the back and covering the main zipper with an extra piece of material. The result is a bag with no visible external zippers, so it’s near impossible for wandering pickpockets to find their way into your bag. Though it does make it tough to get in and out of. Over the ensuing weeks I found that this bag was particularly well-suited for the gadget part of my journey. The Bobby takes a bring-your-own-battery approach (versus the Raden A-22), so you can load in any size battery pack you want. There’s even a handy external USB port at the bottom that lets you charge you battery without fishing it out. To handle the charging duties I went with Mophie’s monstrous 20,000mAh Powerstation XXL ($100). Fully charged at the outset of my trip, I placed this beast in my bag and never had to recharge it. For two weeks, it served as three people’s charger when phones would get near bone dry after a long day of photos, GPSing, and Pokémon Go. Combined with the Bobby, it was was the silent MVP of the trip. While charging is crucial, the most important gadget in any travel arsenal is your camera. I decided to take along a Galaxy Note 7 ($900) for quick shots and a dedicated mirrorless DLSR, the Olympus E-M5 Mark II ($1,100) for all the others. However, within the first few hours on the ground in Amsterdam, I realized that my smartphone was more than capable for the task at hand. It should, however, be noted that I am not a professional photographer. There were no long exposure night shots or wide lens vista shots in my future. But I do still have standards, and when the Note 7 isn’t exploding it’s an incredible point and shoot. Super fast focus, great clarity, astounding color reproduction, and it can shoot in RAW, which is useful for rescuing bad photos with editing later. Also, the Note 7 can tweet. The Olympus, not so much. With that being said Note 7s have been known to explode and is currently the subject of a recall. So the new iPhone 7 Plus, which also shoots in RAW, might be a good alternative. But only a Samsung phone will work with the gizmo I was most excited to use: the Samsung Gear 360 ($350). From the outset, this little gadget has two shortcomings—the Galaxy phone exclusivity and that TSA always flags this camera as suspicious. I guess it’s somewhat bomb-shaped? Whether in Dam Square or in the clock tower of Salisbury Cathedral, I could set up the small tripod and start capturing VR video within seconds. Which means I will never have to remember what was happening behind me during a great shot again. Here’s an example of a 360 video shot in the middle of the Salisbury Cathedral bell tower at midday. Warning: It’s loud. The camera was indispensable for capturing wide-angle photos too, and I also set it up on tables and captured timelapses of every drinking hole I stumbled into. As for a laptop, I decided to only use a 12.9-inch iPad Pro ($800) because it could double as a magazine/comic reader and light computing device. I had enough memory in my devices, that I didn’t need to import files from my cameras or anything. I stick by my recommendation that Samsung’s Galaxy TabPro S is the best if you need an actual computer with you. But for a personal vacation, the iPad Pro treated me nicely. The final successful piece of this travel puzzle involves a gadget that never even left my apartment. When you’re halfway across the world, home security cameras can give you so much needed peace of mind. I opted for Logi’s HAL 9000-esque Circle cam ($170). It’s app game is strong, the controls are logically laid out and its 24-hour motion recap is invaluable. But I’ve found wi-fi connectivity to be finicky. It also charges through an unconventional ring charger and if the camera isn’t set just right, then your camera dies within a few hours. The next vacation might warrant a different security camera. And it will warrant a plainer mode of hydration too. The one gadget I’d do without next time was the one I used was when I wasn’t drinking a beer or some variety of cocktail. The Thermos Connected Bottle and Smart Lid ($60) is designed to help keep track of your daily H20 intake, which can be a problem when traveling. For the most part, the Smart Lid works exactly as advertised. However, the app has a very simple interface that can be a bit glitchy, and the last thing you want on a vacation is a fussy gadget telling you what to do. Overall, these gadgets didn’t usher me to the technological travel wonderland I was hoping for, though some certainly helped get me closer than others. 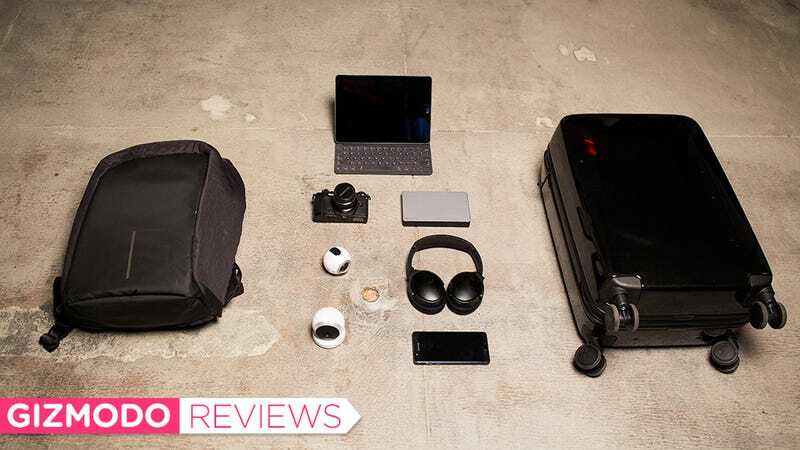 I don’t think I’ll travel without some type of backpack wired for charging or noise-canceling headphones ever again, and I loved toting around a 360-degree VR camera more that I thought. The Gear 360 created some of the most memorable content that slams me right back into the middle of my trip. But sometimes it’s okay to take a step back from the gadget festooned smart bag, get a sip of water, avoid checking in on the abandoned abode and just breathe. The world is as connected as we choose to make it. For me, a wide-angle shot of my favorite spot atop Salisbury Cathedral was priceless.